“To me, innovation is pushing the parameters of the customer's expectation - where the industry is - and looking into where the greatest opportunity lies in the future - and then creating a product, a process or experience around that,” Baylis told CMO. Baylis is on a mission to help people make healthier food choices and provide a more personalised gastronomy experience. The company, SumoSalad, has about 100 stores and close to 1000 staff across its network, serving eight million Australian salads per annum. In a $19 billion sector, Baylis said innovation has steered the company’s success from the outset, helping it become one of the first healthy food chains available in a sector that has witnessed a significant market shift. Speaking candidly with CMO about the birth of the company, Baylis admitted he was overweight and wanted to start a business that addressed a healthier lifestyle and promoted healthier living. “I started the business with my co-founder 14 years ago and that was on a personal need. I was working overseas and put on about 50 kilos through living an indulgent unhealthy lifestyle. 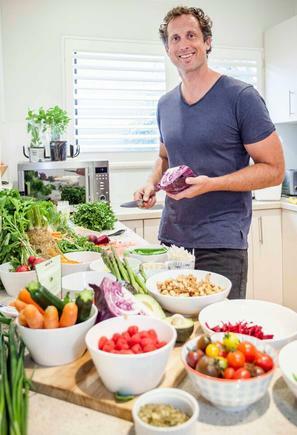 I came back to Australia and I just needed to make a lifestyle change,” he said. “And so we started eating healthy, started exercising, and the change to my mentality, to productivity, to my relationships was just so huge that the more I did it, the more I understood the importance of it and the benefits of it. Admittedly, decisions about health are confusing, Baylis said. “Many people are baffled by it. Should I be vegan, should I be paleo, should I eat carbs,” he said. SumoSalad is engrossed with its work in personalisation, particularly around the personalised health platform currently being built, named MySumo. “We are creating a platform which makes health personalised down to an almost anatomical level, so everyone looks at people's specific blueprints and provides them with a solution that best suits them to avoid a lot of the confusion associated with making different dietary choices,” Baylis explained. Essentially, MySumo takes a range of data inputs from taste preferences to biometrical data to health objective data (aspirational data and psychometric data) to sophisticated medical data, which will be added in the future. That information will then provide customers with a bespoke set of guidelines around what consumers need to be eating in order to maximise their personal potential. Additionally, the company is creating SumoSociety, an open platform database where people can share content (health insights and blogs) specific to their needs or objectives. SumoSociety, which works in conjunction with MySumo, will provide content and insights and offers the ability to have peer-to-peer data sharing with people within your network or social network. It is specifically around health and wellbeing and choices. “If you’re prone to diabetes, and you want to find out what other people are doing, what their eating or some of the challenges or things they’ve done that have been successful, then the MySumo platform will open up that conduit for communication in the future, and that’s a big part of the innovation that we’re trying to develop,” he said. “One of the things that’s really important with innovation is not just your ability to understand insights and be creative, but one of the key drivers of innovation is to be able to communicate throughout the business, and execute,” Baylis continued. Asked about the latest marketing trends including customer experience and personalisation, Baylis believed they are changing the way people interact with the world. In terms of data analytics, SumoSalad has all of its transactional, accounting and business intelligence tools in-house, but does look to a third-party player to help the company take its transactional data and apply psychographic and customer behaviour analysis and social inputs. “This is when you really start to see some interesting data that on the surface isn’t as obvious,” Baylis said. “We changed our whole team. We were set up quite traditionally originally for a normal QSR. What we’ve done is we no longer have a chief marketing officer; we’ve now got a chief customer officer [Lawrence Mitchell], who heads marketing and the whole customer journey through from service in stores to the content they receive, to the in store products. Baylis agreed the move to get rid of the CMO position is unusual, particularly at the top end of town. At the same time, the company is building its marketing and IT team, hiring Ashley James as its new content creator. “The next big thing we’re doing is hiring a head of content into the business, which we’ve never had before. We haven’t been a content creator,” Baylis said. “We’ve always shared other people’s content, or shared customer content, but we’ve got so much insight that we’ve got the ability to now create very thought-leading and industry-leading content to be able to publish some of that content. Meanwhile, on the digital front, Baylis said the goal is to make it as frictionless and as intuitive as possible. SumoSalad's chief customer officer, Lawrence Mitchell, will be joining a stellar panel of marketing and brand owners to debate what it takes to innovate and drive growth in your business at our upcoming CMO Momentum conference in Sydney on 20 July. Don't miss this fabulous event on modern marketing leadership and get your ticket now!